Trumpeter and vocalist Gordon James and his band preform original songs from his newly released New Orleans-style CD and popular songs from other artists. On Sunday, February 24, from 3:00 – 5:00 p.m., the Princeton Country Dancers present a family dance with square dances, contra dances, play party games and other traditional American dances; it’s great fun for the whole family, from children to parents and grandparents and other folks of all ages. Dances will be led by caller Richard Fischer with live music provided by the Mixed Age Dance Band. Musicians of all ages and abilities are welcome to join the MAD Band - there is a rehearsal immediately before each family dance. Dances take place at the Suzanne Patterson Center, 1 Monument Drive, Princeton, NJ. $7 per person or $20 per family. For more information go to http://www.princetoncountrydancers.org/family-dance or call 609-683-1240. Celebrating great African American composers with Samuel Thompson, violin. $30-$65. Dance lesson followed by open dancing from 5 to 8 p.m. No partner needed. $15. The television host, cookbook author, and restauranteur signs copies of and discusses her memoir, "My American Dream: A Life of Love, Family, and Food." 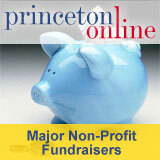 Proceeds benefit Princeton High School students. $75. Send name, address, phone number, and a check payable to Dorothea's House to Eleanor Pinelli, 143 Mountain Avenue, Princeton, NJ 08540 to register. Jack Feinstein presents "I did my DNA test, I was contacted by 3rd and 4th cousins, now what?" and Juliet Beier presents "I have DNA results -- what do I do now?" Free.